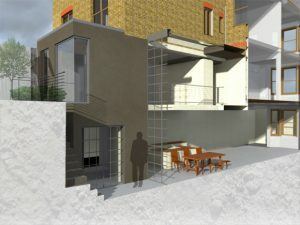 Granit have successfully gained planning permission for a new basement and rear extension to a terraced property in Briarwood Road, Clapham, London Borough of Lambeth. The proposals include a two storey glazed facade and roof which will provide light and space to the contemporary open plan kitchen / diner in the basement. A mezzanine lounge will be formed on the ground floor overlooking the dining area linking the two spaces via a spacious atrium. A secluded rear courtyard provides direct access to the basement and is linked to the garden via an external staircase. We are looking forward to transforming the proposals into an exciting built reality. Work is due to start on site end of 2012.